Henry Tang, the man tipped to be Hong Kong's next chief executive, has blamed his wife amid a scandal over a basement built illegally in their home. The structure under the swimming pool reportedly includes an entertainment suite, a jacuzzi and wine cellar. The 59-year-old said he would not quit the leadership race despite public criticism. Hong Kong's next leader, who replaces Donald Tsang, will be chosen by a 1,200-member committee on 25 March. The seemingly minor scandal has set off a media frenzy rare even for Hong Kong's free-wheeling press, reports the BBC's Juliana Liu. 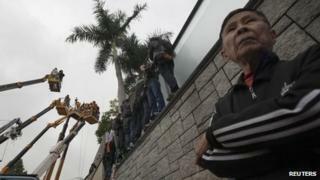 On Thursday, journalists and protesters besieged Mr Tang's home in the Kowloon district. Cameramen brought cranes to see into the premises while angry citizens gathered outside. Mr Tang had denied the existence of the basement structure - which violates building regulations - saying that it was just ''a hole in the ground to store things in''. Local newspapers then published plans of the 200 sq m space, dubbed an ''underground palace'' by one tabloid. In land-scarce Hong Kong, many live in flats a quarter of that size. The wine cellar became a focal point for public anger as Mr Tang, heir to a textile fortune, is well-known to be a wine lover. He told reporters at a press conference that he had not handled the matter swiftly. He has denied trying to cover up the matter, saying he was only trying to protect his wife. "I ask the people of Hong Kong to give me a chance to serve the people," he said. The son of a Shanghai businessman, Mr Tang is said to be Beijing's favoured candidate for Hong Kong's top civil servant job.